Before the My Little Pony Equestria Girls were stylish girlfriends, they were the best of pony friends. This doll and pony set tells the story of both sides of the magical mirror, featuring a Fluttershy Equestria Girls doll alongside her pony alter ego! Each one is a stylish rocker with matching hair! You'll have a blast giving your doll a chic hairstyle to match her sassy look, and she's ready to rock out. Your My Little Pony adventures will be totally magical on either side of the mirror with this pair of hard-rocking pals at your side! 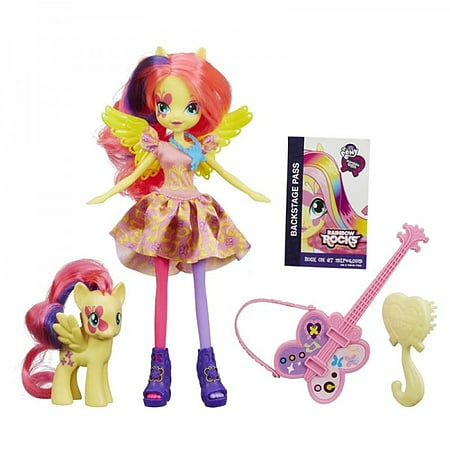 Set includes: Fluttershy doll, Fluttetrshy pony figure and accessories - guitar, brush, and outfit. Age 5+ Years.